We hear T.G.I.F. weekly. Heck, there is even a restaurant that uses it as their name. Sadly this is a message that we hear so often we have come to accept it as a truth. We are here to say that this is a truth that we must change! As kids we go to school and look forward to the weekend to be able to play, stop listening to teachers and have more time to hang out with our friends. We looked forward to a break from the homework, the tests and the routine that school put upon us. As we reach college the days all start to blend together between classes and the job that we have also taken on and we don’t know which way is up! -We see people come to the office on a Monday depressed they have to return to work and that Friday is so far away. 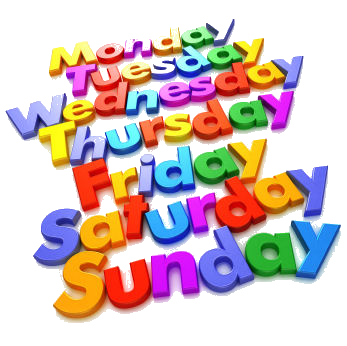 -Tuesday is a little closer to Friday although it is still just after Monday and still part of our recovery. -Thursday is a good day for most people and will be referred to as Friday Eve by many that can now taste the freedom of their weekend. -T.G.I.Friday finally! A day to get all of those projects done and get on with our weekend and our time. What if this was different? What if you taught your child to look forward to going to school on Monday and also appreciating the difference that the weekend brought? What if when you were in college you looked forward to the diversity in your schedule between course load, any employment you had and the nights of pub crawls and hanging out with friends? -Excited to head into the office on Monday to be with your co-workers and see what changes you could make to help someone in their life that day. -Tuesday would be just another opportunity to help and spend time at a job you love. -Wednesday would still be “hump day” and now that would bring you a feeling of joy as you found yourself right in the middle of the week of work. -Thursday would be a day of success as others around you might be happier and that could add to your ability to help. -Friday would finally show up and it would be a day of pulling together projects and other loose ends before the weekend was upon you. -Saturday and Sunday would arrive and you would appreciate the change in schedule. Spending time on other tasks of your choosing, hanging out with your family and friends and maybe even sleeping in or staying up just a little later. When Sunday night came, instead of dreading heading back to work Monday, you would find happiness in all aspects of your life. Are you enjoying what you do or are you counting the moments as you wait for the end of the day on Friday?